Around 20 foreign journalists on Tuesday left Beijing for North Korea by a charter plane to observe the dismantling of the Punggye-ri nuclear test site, three weeks ahead of leader Kim Jong Un's scheduled summit with U.S. President Donald Trump. North Korea allowing foreign media to conduct on-the-spot coverage of the facility's shutdown is seen as a sign of goodwill from Kim, who has recently committed to denuclearization -- but skepticism lingers that it may be only a "political show." In Seoul, the Unification Ministry said North Korea declined again to accept a roster of South Korean journalists who were supposed to visit the test site. As a result, they could not board the charter plane, arranged by Pyongyang, with other foreign reporters. Pyongyang has said it will hold a ceremony to mark the closure between Wednesday and Friday, depending on weather conditions, and that journalists from China, Russia, the United States, Britain and South Korea would be allowed to observe the site. Punggye-ri is where North Korea has conducted all of its six nuclear weapon tests to date, beginning in 2006, including the most powerful one last September. U.S. and Russian reporters said they received visas at North Korea's Embassy in Beijing on Monday. The plane took foreign journalists to the eastern coastal city of Wonsan, where North Korea has set up a press center for them. They are scheduled to visit the test site by a special train. The North has not issued visas to the South Korean journalists initially invited to attend the ceremony at the test site in the country's northeast. At the airport on Tuesday, some South Korean journalists waited for their visas to be issued until the plane took off. "We are still watching the situation. Nothing has yet to be determined," a South Korean photographer who was slated to be part of the media corps, told Kyodo News. South Korea also tried to send the list of the journalists it proposed cover the event to North Korea through their communication channel at the truce village of Panmunjeom on Friday and Monday, but Pyongyang was unresponsive. North Korea is believed to be testing Washington's mettle ahead of the scheduled June 12 summit in Singapore. At his summit with South Korean President Moon Jae In on April 27, Kim pledged to shut down the key test site in May and disclose its closure to foreign experts and media to ensure transparency, according to Moon's office. But North Korea did not invite experts, such as those from the International Atomic Energy Agency, to observe the dismantling, raising concern that the actual condition of the nuclear test site will not be revealed. All the tunnels at the test site will be destroyed by explosions and the surrounding area will be completely closed, North Korea's Foreign Ministry was quoted by the country's official media as saying earlier this month. "We hope that North Korea is going to be transparent like they said," Will Ripley, a CNN correspondent based in Hong Kong who is on his 18th trip to North Korea, told reporters before departing from Beijing International Airport. 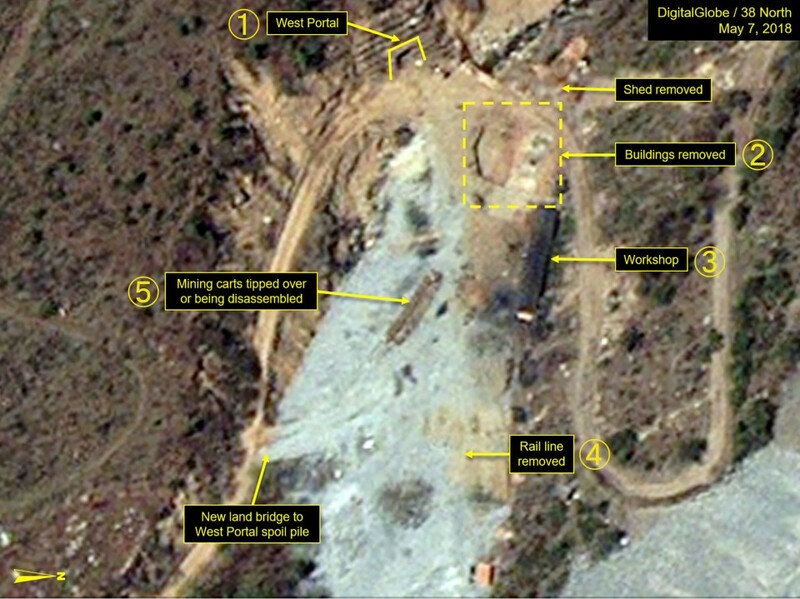 Last week, the U.S.-Korea Institute of Johns Hopkins University said on its 38 North website that satellite footage has shown North Korea is preparing "to build a safe reviewing stand for visitors to observe the explosive closure of all three Punggye-ri portal areas."